Sr. Vickie Perkins, a long-time educator, was born in Dodge City, Kan. She attended St. Mary School (renamed Immaculate Heart of Mary). Following her graduation from Archbishop Hogan High School— formerly an SCL-run school—she entered the SCL community. After teaching one year in a Chicago grade school, the Sisters of Charity called her back to Leavenworth to earn her degree in education at Saint Mary. She then went on to complete her Master of Arts in Mathematics at Ohio State University. Following her graduate degree Sr. Vickie taught high school math for 22 years—11 years at Bishop Ward in Kansas City and 11 years at Hogan High School (and then, served as Hogan’s principal). She was an indispensible member of the Central City School Fund, a group working to raise scholarship funds for Catholic families in need, and she was also named the superintendent of diocesan schools, a position she held for six years. After serving as the Executive Director of Mount St. Vincent’s Home for Severely Emotionally Disturbed Children (Denver), Sr. Vickie accepted the charge of opening a new Cristo Rey High School in Kansas City in 2005. 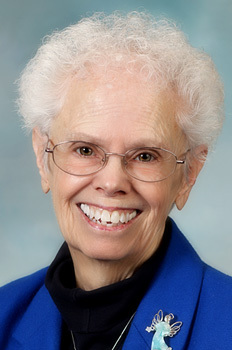 Sr. Vickie was named founding president of the unique Cristo Rey (“Christ the King”) education model, which combines Catholic secondary education with a work-study program. In June 2011, Sr. Vickie retired from Cristo Rey and was inducted into the Mid-America Education Hall of Fame. She now leads a poverty assistance center, Welcome Central, in Leavenworth—completely operated by volunteers. The center provides transportation and evening shelter, along with helping those in need apply for birth certificates, complete disability forms, and prepare for job interviews. Sr. Vickie has touched thousands throughout her career—and the list? Ever-growing. Words could never do justice to the impact she’s made … and continues to make on our world—caring for our brothers and sisters in Christ. 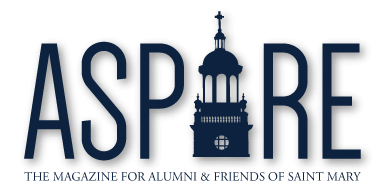 She serves as an inspiration to so many, and Saint Mary is proud to honor her and her work at SpireFest 2017.